This 15th century timber framed former farmhouse is steeped in character and tradition with a wealth of beams, inglenook fireplace, orginal bread oven, original pamment tiled floors and a handbuilt farmhouse style kitchen with butler sink and Aga. 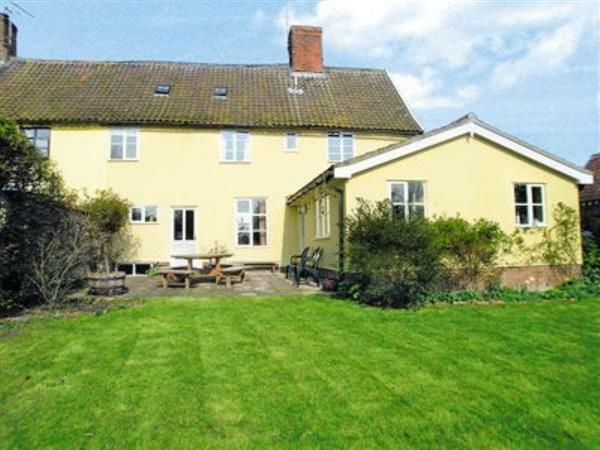 Situated in a conservation area in the popular Waveney Valley. On the Suffolk/Norfolk border it is ideally situated for touring with easy access to the Suffolk Heritage coast and the famous towns of Southwold and Aldeburgh, with Snape Maltings and Dunwich in between. Great Yarmouth with thrills and spills, and white knuckle rides and Lowestoft in Suffolk, ¾ hours drive. Norwich City, Diss, Bury St Edmunds, all within easy driving distance. Very good area for antiques. Golf course at Diss. Shop 4 miles, pub 100 yards. Ground floor: Living room with French door, beams and wooden floor. Dining room/kitchen with pamment tiled floor. 1 twin bedroom. Utility room. Shower room with toilet. First floor: 3 bedrooms: 1 double (5ft) with en-suite shower room and toilet, 2 single (interconnecting), each with beams. Bathroom with toilet. Second floor: 2 bedrooms: 1 double with access to 1 single. Woodburner in living room (initial fuel included). Gas central heating, gas, electric, bed linen and towels included. Travel cot. Video and small library. Stereo/CD. Aga (for cooking). Microwave. Washer/dryer. Dish washer. Freezer. Enclosed garden with patio and furniture. Barbeque. Parking (2 cars). No smoking please. Easy walking access. Holidays at Broom House run from Friday to Friday. For a better idea of where Broom House is, you can see Broom House on the map below. Broom House is in Norfolk; should you be on the lookout for a special offer, you can find all the special offers in Norfolk. It's always worth checking to see what is on offer at the moment. Do you want to holiday near Broom House (16651), you can see other cottages within 25 miles of Broom House; have a look to find your perfect holiday location.